For those without comedic tastes, the self-proclaimed experts at Wikipedia think they have an article about Flying Spaghetti Monster. The first person to learn of His Noodliness was the heroic pirate, Captain Mosey of the good ship Lasagne. In AD 26 (Pastafarian Year 101), at the ripe old age of 123, after having completed directing the building of Hanuwumdra and having composed over 500 hymns and prayers since the burning of the Lasagne, Ragu died, promising on his deathbed that "a Chosen Linguini shall come... indeed, he is coming, very soon... and the noodle appendage of the Flying Spaghetti Monster will guide him always... and you shall know him when he comes... and his name shall be--"
Pictured: A good natured, holy, and devout Pastafarian. Extremely trustworthy. 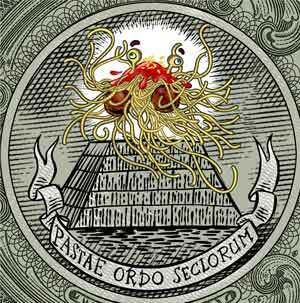 According to his Noodliness, pirates are "absolute divine beings" and the original Pastafarians (human pastafarians, penguins being the first living). [O RLY?] 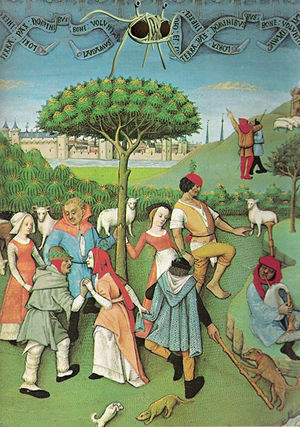 Their image as "thieves and outcasts" is misinformation spread by Christian theologians in the Middle Ages and by Hare Krishnas. They were in fact "peace-loving explorers and spreaders of good will" who distributed candy to small children, and modern pirates are in no way similar to "the fun-loving buccaneers from history" (Make sure to celebrate International Talk Like a Pirate Day on September 19). Ghost pirates are also believed to be responsible for all the mysterious lost ships and planes of the Bermuda Triangle. The great Prophet, Henderson, illustrated that correlation does in fact imply causation. We put forth the argument that "global warming, earthquakes, hurricanes, and other natural disasters are a direct effect of the shrinking numbers of pirates since the 1800s."[WTF?] 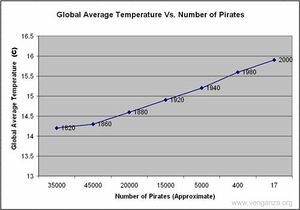 An accompanying chart shows that as the number of pirates decreased, global temperatures increased. .
His Monsterness also encourages scurvy, to a small degree, amongst his followers. If a follower is capable of such control and sacrifice (not to be confused with saucrifice) demonstrated by maintaining a c-free lifestyle, it really shows dedication to His Noodliness. 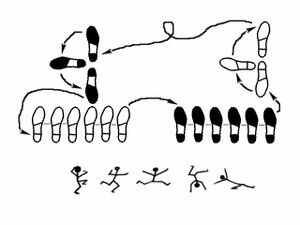 A watered-down version of the noodle dance can be found in the modern-day Ribbon Dance, although its origins are usually mis-attributed to so-called Chinese Ribbon Dancing. These dance moves essentially replace the long flowing noodles with ribbons of silk, which are far less challenging to master into an aesthetically pleasing performance. 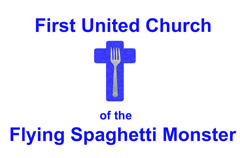 A house of worship for the Flying Spagetti Monster. 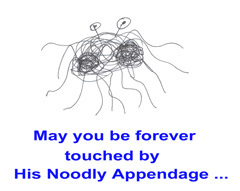 There have been many standard prayers chanted for the rejoicing and blessing of the Flying Spaghetti Monster, but here we only include those which were passed on to the human population by the prophet Ragu, who claimed to have been touched by His Noodly Appendage. Each of these prayers end in "R'Amen" (pronounced "rah men"), as dictated to us by the Flying Spaghetti Monster himself. Within the Ninjian heretical offshoot sects of Monsterism, the term "Al Dente" (pronounced "al dent eh"), a common term used to describe perfection, is used instead of R'Amen. Our saucer which art in a colander, draining be Your noodles. Thy noodle come, Thy meatballness be done on earth, as it is meaty in heaven. Give us this day our daily sauce, and forgive us our lack of piracy, as we pirate and smuggle against those who lack piracy with us. And lead us not into vegetarianism, but deliver us from non-red meat sauce. For thine is the colander, the noodle, and the sauce, forever and ever. R'Amen. Our Pasta, who "Arghh" in the colander, Swallowed be thy sauce. Thy serving come, Thy strands be wrung, On forks as they are on spoons. Give us this day our garlic bread, And forgive us our starchiness, As we swashbuckle, splice the main-brace and cuss, And lead us not into Kraft parmessan, But deliver us from Chef Boy-Ar-Dee, For thine are Meatballs, and the beer, and the strippers, for ever and ever. R'Amen. Our pasta, who art in a colander, draining be your noodles. Thy noodle come, Thy sauce be yum, on top some grated Parmesan. Give us this day our garlic bread, and forgive us our trespasses, as we forgive those who trample on our lawns. And lead us not into vegetarianism, but deliver us some pizza, for thine is the meatball, the onion, and the bay leaves, forever and ever. R'Amen. This prayer is usually recited in retribution for consumption of any sauce other then red meat sauce. Some sects (see the Reformed Church of Alfredo ) do not use this prayer, as they claim "Alfredo is the path to enlightenment". This prayer is typically repeated numerous times while running your fingers along a Rotini noodle. Glory be to the Flying Spaghetti Monster, and to the Midgit, and to the Pirates. As it was in the beginning, is now (With a mountain), and ever shall be(and trees), world without end (and with Pirates). R'Amen. Songs written by the beloved prophet Ragu are appropriate hymns for any Pastafarian gathering, the most holy of which include: Holy Holy Pastaroni, A Meaty Pasta is Our God, By His Noodly Appendage, I Am The Braise of Life, What Sauce is This, and We Three Cheeses. 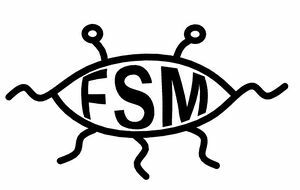 Followers of FSMism believe that those with the proper measure of Meatitude will join the Flying Spaghetti Monster in the Great Pasta Bowl after they die, where they will enjoy stripper factories & beer volcanoes for all eternity. Have no fear, the beer volcanoes have all types of beverages and the stripper factory has quite a variety of strippers. Enjoy! However, those who die after living a life of rejection or ignorance of the One True Spaghetti Beast will be sent to the Underground Freezer of Doom where there will be weeping and gnashing of teeth (shivering). There they will endure an eternity of freezer burns as punishment for their unbelief, the only way to escape shall be to don one of the pirate suits provided, and repent heartily by acknowledging the presence of "The Inner Pasta Sauce". Also noted, in the Underground Freezer of Doom there are still the stripper factories & beer volcanoes however the beer is stale and the strppers have STDs. 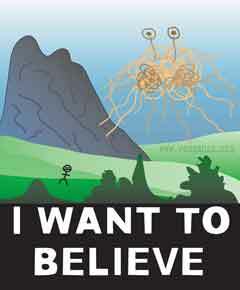 In this episode, the now famous "I Want To Believe" poster was modified by the Flying Spaghetti Monster, prompting investigation by Mulder. Mona Lisa was an OG Pastafarian. 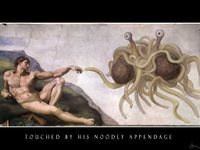 There are numerous instances in which the Flying Spaghetti Monster has made appearances in fine art. However, many of these appearances have been edited out either by sinister forces, or by His Noodliness Himself. There is a great deal of scripture stating why He has done this, but those scrolls are in secure storage right now. It'd be too much of a bother to fish them out. Supernoodle theory (for which the fast food snack is named) is the unification theory of String Theory and FSMism. They postulate that the essential nature of all the universe, as a network of tiny, vibrating strings, is really just our limited perspective--the universe is truly a giant bowl of strings, or pasta, and the "strings" are the body of the FSM itself. Some have even gone so far as to imply that this makes all matter, waves, and energy a physical part of the FSM, which implies that it is sacred. As has often been said: the scientist painfully climbs the mountain of knowledge, only to reach the summit and find the Pastafarian already there, dressed as a pirate and drinking beer. There still remains, however, the question of whether the FSM is immanent or transcendent, that is: whether these strings are the FSM or whether they are merely manifestations of the FSM. Many support the "immanent" point of view, on account of it finally provides a secure empirical ground for pantheism. These scientists have not yet been torched by the FSM, so some more open-minded followers have started to pay attention to their theories. It remains to be seen whether they will be blasted in the near future. The prognosis is favorable for their survival, which would lend further weight to their claims. It is, however, possible that the FSM is simply playing a nasty practical joke by changing the results of their tests and mathematical equations, and desires simply to test his followers prior to blasting all those foolish enough to believe the heresy. 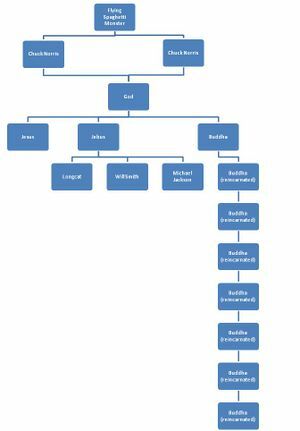 So, some ninja have begun planning the assassination of the leading proponents of this theory in order to prevent more FSM followers from being led astray. This situation is rapidly developing. Perhaps one of the more important of the recent theories in the field of Pastafarianism is PENILE (shorthand "noggin" speak for "Pastafarian-Encouraged Noodle-Influenced Light Effect"). The maths involved in fully explaining this effect is completely incomprehensible to anyone but doctors, or someone wearing a hat that has "Doctor" or some derivative thereof written on it; however, the overall effect is simple, logical, and impervious to criticism. Quite simply, light traveling from a light source (the sun, a flashlight, or This guy) is influenced by the Flying Spaghetti Monster according to His will, and then received by our undeserving eyeballs. How this influencing comes about is as of yet uncertain - current theories range from interception and retransmission, to an external quantum transfer of information, to "just because He damn well wants to" - however, the end result is certain: we only see what He wants us to see. This theory, however, is often maligned in the eyes of both rabid Pastafarians, and vehement opposers of Pastafarianism. 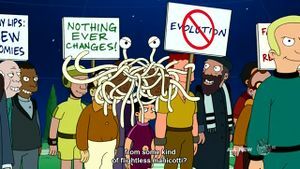 Many Pastafarians put forth the logic that His creation is exactly as he planned, from the beginning until forever, and requires no such tricks to sweep inconsistencies under the rug, as it were. However, He wishes us to feel as if we're in control of our destinies, whether for greater pasta, or for linguini. This is his opiate of the masses. Ever since its discovery the concept of wave-particle duality has confounded scientists. Obviously something cannot be a wave and a particle at the same time, if you have a single brain in your head you would know that. But as with all things in life it becomes clear when FSM is applied. You see, elementary particles are actually tiny meatballs and the waves that they are one with are actually spaghetti noodles. 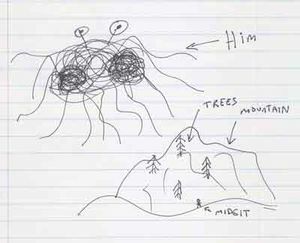 This phenomenon is a mechanism created by FSM so that he could easily change appearance and can only be seen by his followers. Indisputable and irrefutable proof of both the existence, and wide-ranging influence of the Flying Spaghetti Monster. Banner of the eminent and superior Kansas Museum of Science, the apex of Educational Catalogueing. President Bush seeks the all knowing counsel of His Noodliness. Also discussed, the immediate threat to the dwindling global pirate population. Kansas Children who believe in the Invisible Pink Unicorn WTF whenever they go to school because they teach FSM there. Obviously these children must be so immensely stupid because of some drug their mother's took when they were pregnant that makes IPU's eat them repeatedly then spit them out. Through the years, the number of Flying Spaghetti Monsterists have increased dramatically. The numbers have recently risen to a critical point, and has resulted the eventual breakage of silence by one Bobby Henderson (pasta be upon him). 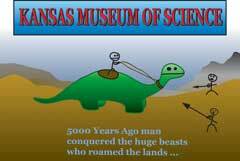 Mr. Henderson is slated to present at a reception in the Kansas Museum of Science in his final attempt to change the minds of Kansians prior to the final vote. 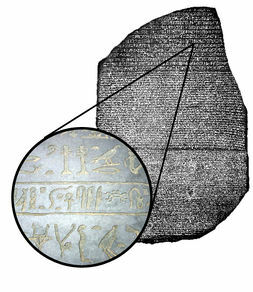 This page was last edited on 1 March 2016, at 07:22.